The new Samsung Galaxy Note7 is getting a pretty solid report card from reviewers; it's been lauded as "the best smartphone money can buy" and "possibly the most complete smartphone ever made." Some might say these remarks are premature -- even blasphemous! -- considering the next iPhone series hasn’t even been announced yet. If Samsung’s killer phablet is already billed as 2016's finest, where does this leave the iPhone 7 and iPhone 7 Plus? Based on all the expert analysis and leaked rumors setting the internet ablaze, just weeks away from Apple's big September 9th unveiling… not at the top spot. Here's how the Galaxy Note7 might have already bested Apple's next-gen smartphones. Using your fingerprint to get into your home screen is cool, I guess, but Apple's Touch ID is certainly not hack-proof. Samsung's upped the ante on the Note7, with both a fingerprint scanner and an iris scanner that accomplishes the same task in a more secure fashion. You can use it to unlock your phone, or just to unlock certain secure folders of, uh, stuff you don't want other people seeing (more on that in a sec). 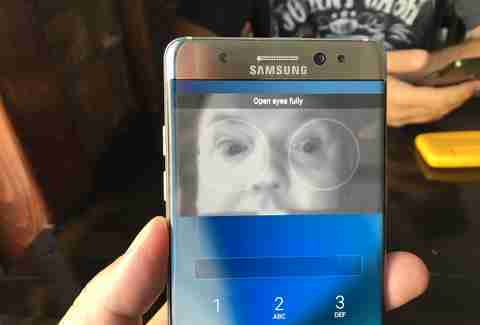 Meanwhile, insiders say Apple won't start rolling out iPhones with iris-recognition technology till 2018. Jony Ive's made it clear that Apple will never compromise design for better battery life, so iPhoners can look forward to keeping a spare charger or Mophie case on hand at all times. Current factory leaks suggest marginal boosts in battery life are coming to the iPhone 7 (1,960mAh) and iPhone 7 Plus (3,140mAh), and wireless charging could be part of the package as well. That still doesn't make it a battery champion, though. 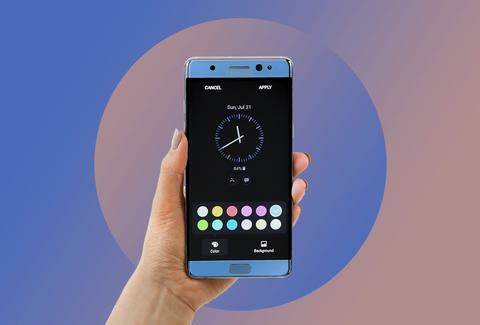 The Note7 boasts a 3,500mAh cell, two different power-saving modes, and wireless Fast Charging that'll take you from 0% to 40% in 30 minutes. The Note7 has the same cameras that came with the Galaxy S7 and S7 edge, and that's nothing to sneer at. The f1.7 aperture and optical image stabilization produce brighter, more detailed images in low-light, moody environs. It has a super-fast autofocus and extensive manual controls, with a "Pro" mode for adjusting shutter speeds and shooting RAW files. The iPhone 7's flashiest feature is rumored to be a dual-lens camera, so we'll have to see if it brings the thunder. Suffering through those "Not Enough Storage" alerts is a common ailment for iPhone users. The Wall Street Journal claims the next iPhone will start at 32GB, with other insiders suggesting a 256GB variant could be on the way. Spare yourself the headache of guesstimating the price on that sucker. Samsung spreads the storage love by loading the Note7 base model with 64GB, and hooks you up with a free 256GB microSD card with a pre-order. And with an integrated microSD card slot, it can accept anything from 512GB to 2TB memory cards. Two TB! That practically saves your entire life onto the handset and is about eight times as much space as the rumored iPhone 7 variant. We've been begging Apple to make a guest-mode feature that would securely hide certain apps or folders from prying eyes. 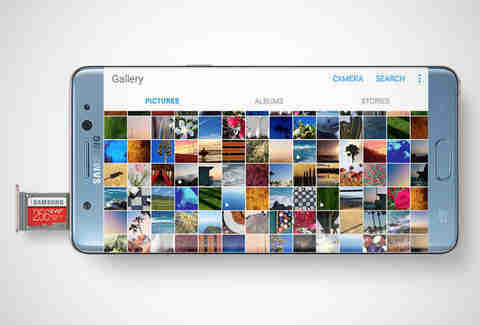 While it's been rumored that some form of guest or panic mode is in the works, Samsung beat Apple to the punch with its Secure Folder option, an encrypted area where sensitive content -- be it webpages, photos, videos, or personal information -- can be stored and accessed. Guess we know where all your risqué Snaps are going. While you've been watching your iPhone sit in a bowl of rice, Samsung's been doling out water-resistant phones like the Galaxy S7. The Note7 follows suit and is built to survive up to 30 minutes in several feet of water; in fact, the WSJ solidified said waterproof prowess by doing its entire review of the phone in a pool. Even the S Pen works underwater. The Note7 just debuted the latest Gorilla Glass 5 panel that's more shatter-resistant and made to survive 80% of falls from heights of 1.2ft. Meanwhile, it's rumored that Apple will welcome OLED displays to limit shattered screens... on the 7s... in 2017. People are getting quite bent out of shape about the all-but-confirmed reports of Apple killing the headphone jack. Over 300,000 people have already petitioned to save it, and even Apple co-founder Steve Wozniak is upset about losing his earbuds. If you're not ready to part ways with your wired devices, the Note7 supports both Bluetooth and a headphone jack to offer the best of both audio worlds. The Note7’s panel is as good as it gets. It's a bigger phone at 5.7in, but it's still remarkably sleek with a curved screen, slim depth, and total weight of 169g (the iPhone 6s Plus, by comparison, is 192g). A bigger screen means better resolution -- the QHD display promotes 2,560 x 1,440-pixel resolution. That outperforms the 6 Plus' 1,920 x 1,080-pixel resolution. Word on the street is the iPhone 7 and 7 Plus still won't match up. Some people like large phones for the screen real estate. Others prefer small ones for portable convenience. Apple forces you to choose between the basic iPhone and the larger iPhone Plus. 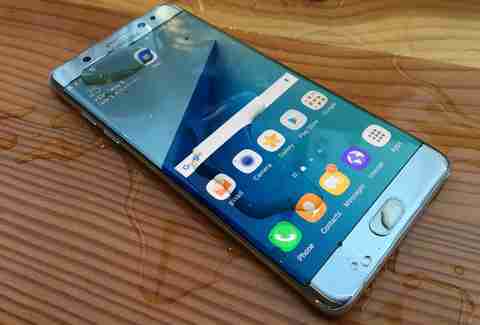 Samsung provides a shorter alternative with the Galaxy S7, but it's also programmed the Note7 for serviceability with its "One-Handed Operation" feature that allows you to shrink the interface to replicate the feel of using a smaller phone. Options are nice. The ecosystem of accessories is bigger. And cooler. And future-proof. For years, everyone stressed how the iPhone ecosystem was far superior to anything on the mobile market. But the Apple Watch and a pair of overpriced Bluetooth "EarPods" aren't going to cut it. Samsung hosts a lineup of cooler interconnected devices that sync with the Note7 for enhanced daily use, and at a cheaper price value -- including a 360-degree camera, fitness-tracking wireless earbuds, a smart car dongle, and VR headsets.